Abrupt swings in policy direction in Asia are detracting from already diminished stocks of US trust and credibility. Somewhat obscured in last week's outpouring of penny dreadful news from Washington (such as Sean Spicer ensconcing himself in the White House shrubbery) was the announcement of a US-China 100-day economic action plan. It is a pedestrian, workmanlike document, committing to a raft of bilateral trade, investment and regulatory measures. Its references to poultry, beef and clearing houses are not obviously the stuff of grand strategy, or grand bargains. It could prove economically beneficial, on its own merits, if China can be persuaded to open its market on more reciprocal terms. Interestingly, China will start importing US liquefied natural gas to meet its energy needs, within existing US export quota limits for non-FTA countries. Politically, it is a significant step forward, given the gathering US domestic headwinds against seemingly any kind of trade deal. A potentially damaging trade conflict with China, widely feared at the outset of the Trump administration, has been averted – for now. Also tucked away with the action plan was an instantaneous commitment to send a US delegation to the Belt and Road Initiative (BRI) summit currently being hosted in Beijing. They must have had their bags packed. A persuasive criticism of the Trump Administration is that it is losing influence in Asia because it lacks a regional economic policy beyond a knee-jerk rejection of existing trade deals, including those already negotiated with US allies and partners under the Obama Administration. As a result, the US is falling back on an over-reliance on the military toolbox. That is the gist of an argument put by Ely Ratner and Samir Kumar in a recent Foreign Policy commentary, pre-dating the US-China action plan. The authors contrast the currently haphazard US approach with China's purposeful promotion of the BRI. Regardless of its merits or demerits, China is communicating a clear vision to a receptive audience in Asia, Africa, the Middle East and Europe. The Beijing forum showcasing the initiative has drawn in 'more than 1,200 delegates from 110 countries, including 29 heads of state'. Trade Minister Steven Ciobo is representing Australia. Japan and India are the only two significant Asian countries still keeping their distance. To some observers, Washington's decision to send a delegation to China's Belt and Road Forum should be welcomed as a sign of growing maturity in the Trump Administration's position – an overdue correction from Barack Obama's standoffishness on the Asian Infrastructure Investment Bank. Australian proponents of closer economic engagement with China will take heart, arguing that trade and investment don't have to be zero-sum. The United States recognises the importance of China's One Belt and One Road initiative and is to send delegates to attend the Belt and Road Forum in Beijing May 14-15. What is striking is the implied subservience of recognising 'the importance of China's' initiative. On Twitter, Ely Ratner compared the wording to Rex Tillerson's verbatim 'aping' of China's 'win-win' formulation for Sino-US ties on his inaugural visit to Beijing. I tend to agree. Words and set phrases mean more to China more than most countries, because they carry encoded meanings intended to be relationally and hierarchically defining. Agreeing on words is more than half the battle with Chinese officials. For Trump Administration negotiators new to diplomacy, especially those from business backgrounds, conceding such framing may seem inconsequential compared to tangible economic and commercial benefits of the type outlined in the 100-day action plan. The Trump Administration is not only feeling its way through the unfamiliar terrain of international relations – it is deliberately mixing traditional boundaries between 'high' and 'low' politics, as part of a wheeler-dealing approach to foreign policy (regardless of whatever advice Henry Kissinger is supplying). Indeed, China may already be embracing Trump's transactional pragmatism with a more brazen variation on the package deal. If Japanese reports are to be believed, in the run-up to the Mar-a-Lago summit Beijing's ambassador to the US requested the removal of Pacific Command's Chief Admiral Harry Harris in return for China's cooperation over North Korea (China's Foreign Ministry subsequently characterised the reports as 'fake news'). Some of Trump and Tillerson's initial tough talk on China was clearly overheated and needed tempering by exposure to policy reality. But now US policy on China shows signs of flipping to the opposite extreme. Since Mar-a-Lago, strategic and commercial frictions have given way to an uncritical embrace of cooperation on both fronts. America's singular reliance on China as the crux of its 'maximum pressure and engagement' approach on North Korea is proving especially useful to Beijing as a source of leverage with Washington for what appears to be a marginally tougher approach towards an indifferent Pyongyang. In the South China Sea, the promised US push-back against China's encroachment has failed to materialise. Nor is there evidence yet of a strategy to guide Washington's actions there. No US Freedom of Navigation Operations (FONOPs) have been publicly carried out since the US presidential election, amid accounts that PACOM requests have repeatedly been spurned. Intriguingly, the Carl Vinson aircraft carrier group not only continued to sail in the 'wrong' direction after it was ordered back to the Korean Peninsula last month, it also diverted around the South China Sea, despite this detour significantly lengthening the transit. Whatever public communication errors there may have been on the part of the US defence bureaucracy, the absence of US FONOPs and the carrier diversion won't have appeared coincidental to Beijing, which has long demanded a US operational pull-back in the South China Sea. 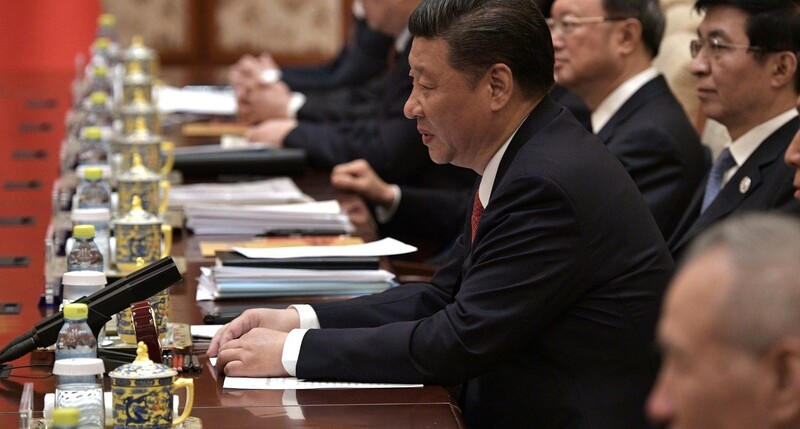 While some US allies and partners may be privately relieved that Washington has adopted a more accommodative approach on the BRI, others will be anxious at this latest turn of events. Japan's antennae are peculiarly alert to any prospect of a US-China 'G2' compact bypassing Tokyo's interests. Security considerations aside, Japan must be piqued about the US-China action plan and BRI attendance, after being left high and dry on the TPP, the main selling point of which, for Tokyo, was preferential access to the US market. India has stayed aloof from the Belt and Road for similar reasons to Japan, and though it is less directly affected as a non-ally, it will still regard Washington's capriciousness with renewed caution. In Southeast Asia, while the Trump Administration has lately moved to engage allies and partners bilaterally and through multilateral fora, the results of the recent ASEAN summit in Manila were not encouraging for those hoping for a concerted stance on the South China Sea. All this runs in Beijing's favour. The choice of National Security Council Asia Director Matt Pottinger to front the US delegation at the BRI forum appears to be Washington's way of trying to split the difference. Pottinger is, if not a hawk, certainly no acolyte of Beijing. But from China's perspective, it's showing up that counts. It would hardly be surprising if the US reverts to a harder line on China once the gulf in their national security interests in Asia is exposed as a result of frustrated expectations over North Korea or incidents in the South China Sea. But these abrupt swings in policy direction are themselves detracting from already diminished stocks of US trust and credibility. China v US: Who needs allies? America’s alliances are not much of an asset at all in managing relations with China. Indeed they are in many ways a net liability, because the benefits they offer are offset by the costs they impose. The re-education camps represent one of the visible planks of an overarching attack on Uighur identity. The Communist Party has cemented its presence in leading tech firms, heralding a new age for private companies.